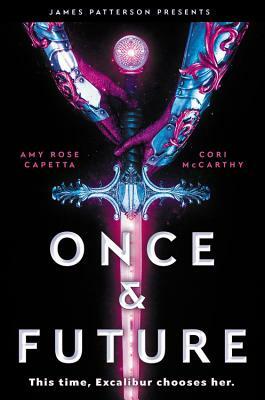 When Ari crash-lands on Old Earth and pulls a magic sword from its ancient resting place, she is revealed to be the newest reincarnation of King Arthur. Together with Merlin, who has aged backwards through the centuries into a teenager, she must break the curse that keeps Arthur coming back. Their quest? Defeat the cruel, oppressive government and bring peace and equality to all humankind. Cori McCarthy is the author of four young adult books, including BREAKING SKY, which received multiple starred reviews and is in development to become a film by Sony Pictures, and a forthcoming nonfiction picture book. Amy Rose Capetta is the author of several YA novels, including THE BRILLIANT DEATH. She is the co-founder of the Rainbow Boxes initiative, which sent LGBTQIAP fiction to readers in all 50 states, and the Rainbow Writers Workshop, which helps find and develop exciting new voices. Malinda Lo is the author of the young adult novels Ash, Huntress, Adaptation, and Inheritance. She has been a three-time finalist for the Lambda Literary Award.